Has the world gone mad? What is this media hysteria? Why all the rage? Are people stupid, or is it just certain editors of certain newspapers? Who made everybody a lawyer? 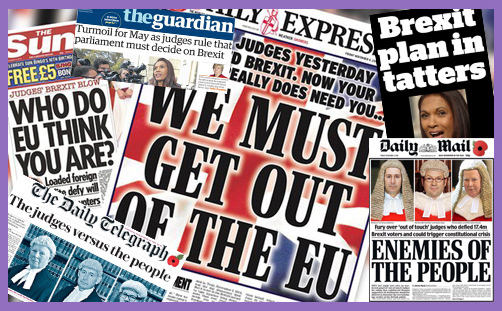 The three judges who determined that invoking Article 50 of the Lisbon Treaty – by which the UK actually commences the process of leaving the EU – does not fall under the aegis of the Royal Prerogative are not “enemies of the people”, nor are they “trying to prevent Brexit”. There is no “constitutional crisis”: Brexit is not “in tatters”. The judges have simply weighed legal arguments and formed a view. Their view is that Parliament must have a say. You may demur. You may even object quite robustly. It was, after all, Parliament that voted 6:1 to pass the decision to the people, and it was the Government which pledged to implement whatever the people determined. But these are British judges sitting in an English court weighing matters of UK constitutional law, and their judgment may be fairly appealed and is being so. Isn’t that due legal process? Isn’t that called sovereignty? What, exactly, is the problem? Is it not preferable to have the whole Brexit process subject to judicial consideration in order that doubt may not be cast in perpetuity on the legality of UK secession from the EU? Isn’t it important to ensure that it’s all done in accordance with UK constitutional arrangements? Hasn’t it been a 40-year leitmotif of our EEC accession and ever-closer EU membership that it was illegal, unconstitutional and even treason? What is to be feared by allowing the High Court and Supreme Court to determine the rule of law? Isn’t it infinitely preferable to have these Brexit legal arguments now, if only in order that Remainers can’t bleat for the next 40 years that we never actually legally Brexited in the first place? The question of who may trigger Article 50 is actually rather important. The Government takes a view that, being a treaty, the prerogative power lies with them; the High Court has said the power belongs to Parliament which must enact primary legislation. What is certain is that the people may not trigger Article 50: they may only express a view. Constitutionally, a referendum is advisory. The advice of the people was clear, but Parliament is omnipotent in all save the power to destroy its omnipotence. There is nothing to be feared (really, truly, nothing) in having Parliament involved in the process of leaving the EU. Many MPs who voted Remain are clear that the people voted Leave, and the will of the people must be respected. They fully intend to vote to invoke Article 50, though it may grieve them to do so. Many are mindful that their own constituents voted for Brexit, in some case by a vast majority, and they aren’t going to risk losing their seats to a resurgent Ukip (which will surely resurge [once again under Nigel Farage] should the Brexit process not result in the people being able to take back the promised control). The House of Lords may seek to stymie or subvert, but the unelected House signs its own death warrant should they attempt to overturn the sovereign will of the people. It is the stuff of which revolutions are made. Lawyers must be free to quibble over whether repeal of the European Communities Act 1972 requires a further act of Parliament, and whether the invocation of Article 50 is a treaty-making/breaking prerogative. Article 50 is not Brexit: it is simply the starting gun to a marathon. The statutory-prerogative dispute is immaterial: either way, it is the Crown which assents, and assent it surely will. There is no question of Parliament attempting to circumvent the will of the people; or of the UK remaining a member of the EU on revised terms. Brexit means Brexit. What is to be lost or feared in having Parliament debate that meaning? Should there be the merest whiff of our elected representatives conspiring to ignore the Referendum result, then robust headlines may be justified, for that would be a certain betrayal. But – good grief – calling judges “enemies of the people” when all they have done is to weigh the discretionary powers of the Executive vis-à-vis Parliament is crass, irresponsible and dangerous journalism. Do these newspaper editors want the social order to break down? Do they want to see respect for institutions shrivel? Are they inciting someone to rid us of these troublesome judges? Isn’t that what the likes of Erdoğan, Mugabe and Putin tend to do?